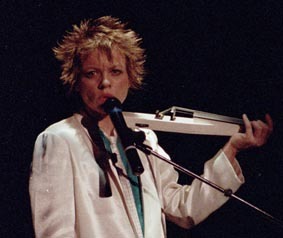 via Laurie Anderson: music for dogs and Obama | Music | The Guardian. 15 Feb	This entry was published on February 15, 2013 at 9:56 am. It’s filed under Article, Music Video, Video and tagged Anderson, Laurie Anderson, National Defense Authorization Act, NDAA, New Jersey, New York, The Guardian, United States. Bookmark the permalink. Follow any comments here with the RSS feed for this post. Laurie’s excellent *Homeland* CD came out during the same period as the trilogy that Dirtday! completes, and Homeland explores some of the same themes: economic or foreign policy bait-and-switch, free speech, abuse of power, etc. Always funny, she is — as if showing “you catch more flies with honey than vinegar”. In fact, she’s been at this since the United Kingdom made “O Superman” a surprise hit in 1981. I recently put a blog post together with a few Laurie Links– interviews mostly. You’ll find it at http://markingtime4now.wordpress.com.